TripVerse dared us to try and accomplish the feat and we took on the challenge, always up for proving adventure travel in exotic destinations is possible, even during a weekend trip. 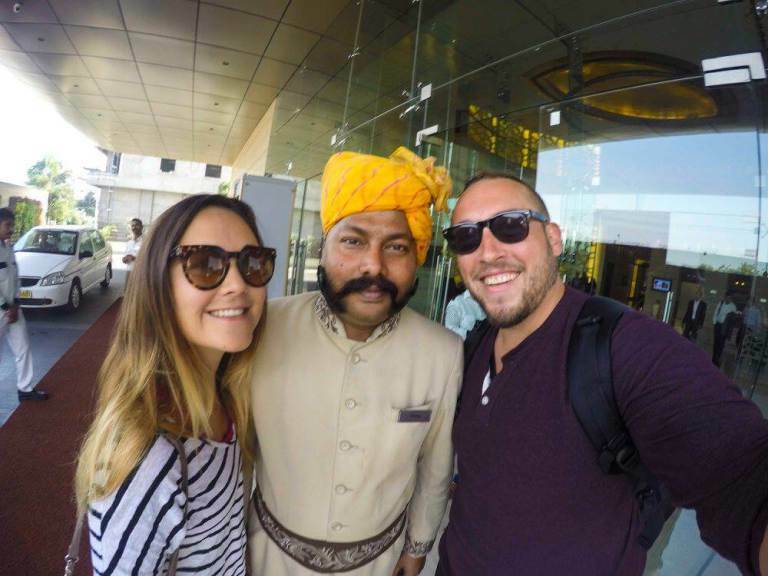 If you know us, you know we take any chance we can to travel, but spending 48 hours in India has been on our list for a long time, and with so many short, cheap flights to India from Dubai, it was only a matter of time before we took on the challenge. Using a three day weekend, we flew direct to Delhi and had a car and driver waiting for us. The Golden Triangle is one of the most popular tourist routes in India, allowing travelers to visit New Delhi, Agra, and Jaipur in just a few days time as all three cities are not only very close together, but vastly different. 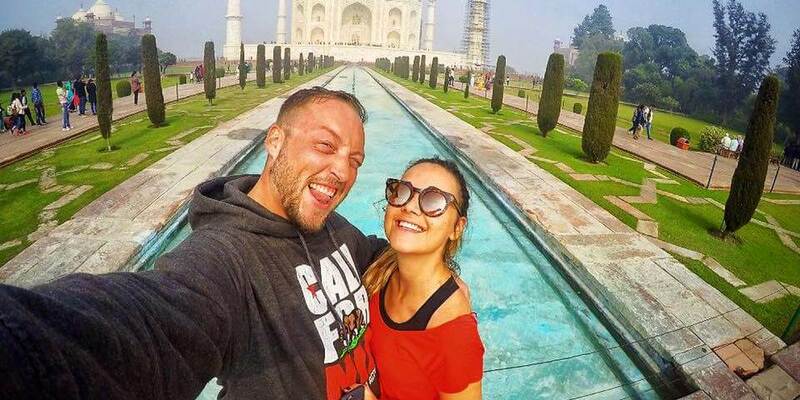 We knew we wanted to end the trip with Delhi, so we immediately landed and headed straight to Agra to visit the Taj Mahal, and tried to get there before sunrise to avoid the crowds. The Taj Mahal is just one of those sights that you can't really believe you are looking at, something you see 1,000 times in pictures and movies your entire life. As we arrived early enough, the entire site was void of crowds and covered in a layer of mist and fog. It was incredible to watch this amazing building emerge from the fog into all its glory as the sun broke. Take your time, explore the area from all angles and take the time to just sit down and stare at one of the most amazing buildings ever built. Remember: No camera tripods are allowed in, so make sure to check them at the entrance building before going in. You'll have to check your backpacks as well. One your way out of the Taj, walking down the street towards the entrance, just passed the Oberoi Villas is a hotel called "Taj Spice" which you cannot miss. Without any of the expense or fuss of such a fancy hotel, you can easily get up to their amazing rooftop cafe and sit outside while enjoying the same beautiful view people pay thousands for at the Oberoi. Their food is delicious and beer cold - and cheap! Check out our full 48 Hours in India itinerary on TripVerse for more detailed information on this and all the places we visited and recommend! As soon as we wrapped up at the Agra Fort and the sun was setting it was on to Jaipur! We raced against the clock to make the 4-hour drive before it got to late and arrived at our hotel around 9 pm. A quick meal and we were off to sleep. We were exhausted but loving the adventure! No 48 hours trip to India should be without a visit to Jaipur if you are anywhere close. It might just be my favorite city in India. There is just something different about being in Rajasthan, the Pink City, as it is called. There is enough to fill 48 hours alone in Jaipur, but we really only had part of a day so we did all the exploring in the time we had and saw a ton! First, it was off to the old part of the city to visit the Jaipur Palace, one of the coolest and most detailed palaces we've ever seen. Make sure to make your way back to the hidden chamber with detailed and ornately decorated doorways honoring the four seasons. Make sure to have your camera ready, they are made for Instagram! 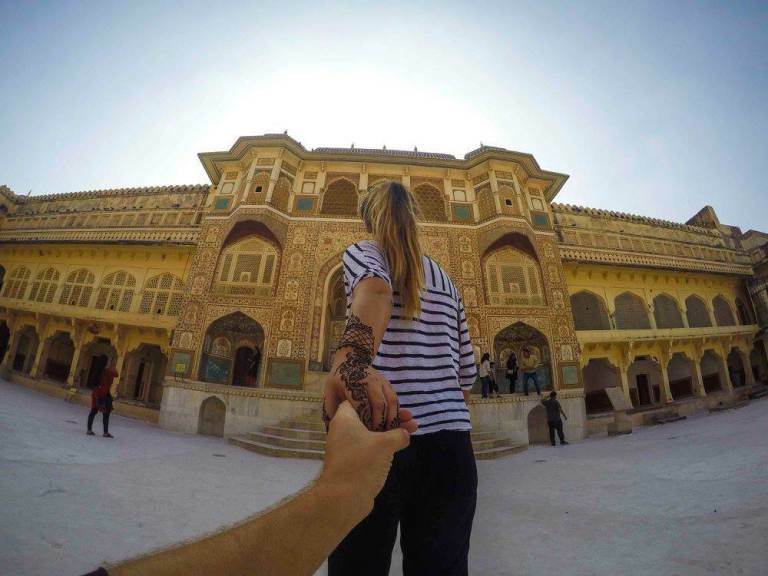 Heading out of Jaipur, stop and visit the Floating Palace and the Elephant Village. We weren't interested in paying to ride or wash the elephants, just wanted to see them. If you drive down the road from the Elephant place, there is an actual village where each family cares for 2-3 elephants and this is really cool to see. Huge elephants and people living in harmony is a wonderful thing. Jumping back in the car with Prakash, we headed directly to the Amer (or Amber) Fort, which is one of the most amazing places we have ever seen that we never knew existed! TripVerse said we should make the trek all the way up the stairs to the top and thank god we did. The Amer Fort is SUCH an amazing place to explore and I am shocked we'd never heard of it before. We could have gotten lost here for hours, so make sure you take the time to just wander through the hidden hallways and secret passageways. You will be amazed at what you find, we promise. Back in the car again, we raced towards New Delhi to wrap our 48 hours in India exploring one of the largest cities in the world and were thrilled to finally reach out hotel right in the middle of Connaught Place, the trendy and hip center of India's second largest city. After a quick sleep, we were out the door and off to explore again. Thank God that TripVerse allows users to download their entire trip and use the offline maps so we knew exactly where we were going with a huge list of places to see before our midnight flight. We immediately started walking the streets and found amazing temples and hidden spots just walking around before we jumped in a tuk-tuk to take us to Humayun's Tomb, which cannot be missed on a 48 hours in India trip - it really is a stunning building and beautifully manicured grounds - a welcome peace and quiet in the bustling city. After an hour walking around we were off to world-famous Chandni Chowk, one of the busiest and craziest markets anywhere on Earth. We wandered the streets just across from the Red Fort and got lost in dark alleys full of camera shops, smelled amazing street food and took in the madness before jumping in another tuk-tuk and heading for Connaught Place again to catch the afternoon light at one of the amazing rooftop bars TripVerse recommended for us. Junkyard was out favorite, where we enjoyed the great music, delicious food, and amazing drinks while watching the traffic below and watching the sun set. We quickly headed out on foot to find the best other spots to recommend to you - all details on our TripVerse itinerary - before finally picking up our suitcases and heading back to the airport to catch a late flight home to Dubai and work in the morning. 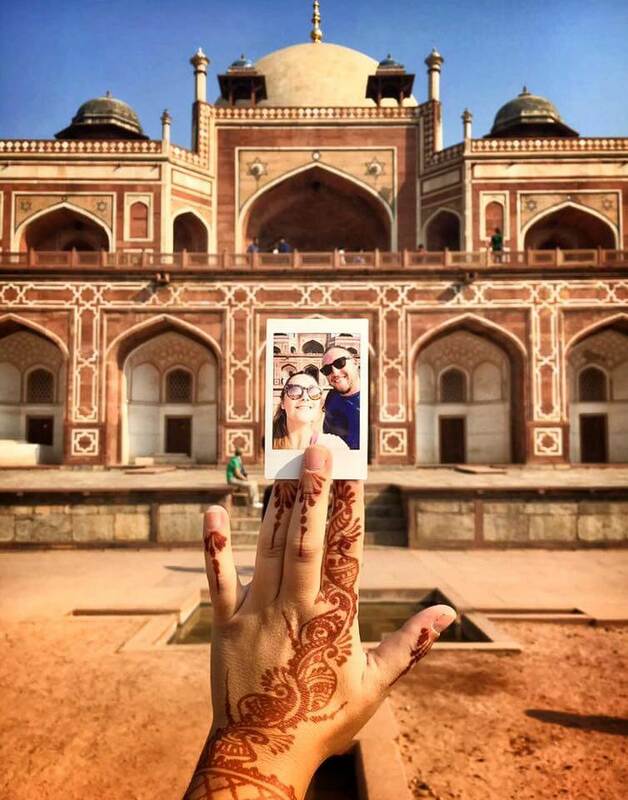 Yes, 48 hours in India is an insane challenge, but one we are so glad we took on. We were able to get just a taste of three amazing different cities and by far had our most pleasant trip to India so far. With the right itinerary planning, getting a driver and knowing exactly what you want to do, it took away so much of the stress normally thought of when speaking of travel to India. We are thrilled to have had the amazing adventure we did, recommend 48 hours in India to anyone thinking about it and hope we proved that yes, you can visit India in a weekend if you plan it right.